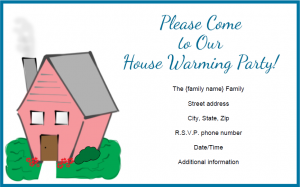 A housewarming invitation is the first step to creating the perfect housewarming party. A good invitation will communicate all of the important information about your party while also conveying the reason for your party - to break in your new home! Any other special info your guests need to know - dress code, party theme, things they should bring, whether the party is adults only, and so on. Also, remember to get your invites out in plenty of time for your guests to plan for your event. Four to six weeks before you party is ideal; that will give people plenty of time to make any necessary arrangements, like hiring a babysitter, before accepting. If you don't have that much time on your hands, three weeks is perfectly acceptable. If you need help downloading these invitations, check out these helpful tips. Armed with all of your party details, you can start coming up with ideas for housewarming-specific invitations. First, choose a design. There are lots of pre-designed invites on the market specifically for housewarming parties, or you can choose to design your own! 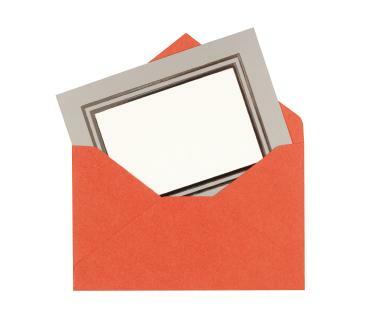 Sketches or photos of your new house make a great choice for housewarming invitations, or you can keep things simpler and use cardstock paper, writing all of the information you need. There are also tons of free invitations available to download and print online, as well as lots of free clip art options you can use to jazz up your homemade invites. Your invitation wording should convey the general mood of your party and should also indicate whether your housewarming party is an open house format, in which people can drop in whenever they like, or a more traditional party with starting and ending times. 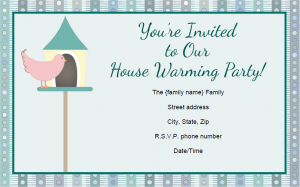 These examples show some wording options for your housewarming invitations. January 12, 7 p.m. - 10 p.m.
Cocktails and canapés will be served - we hope to see you there! Help the Smith Family make their new house a home! January 12, 2 p.m. - ?? BYOB and favorite outdoor game - and don't forget to bring the kids! Bob and Sue Smith need your help to christen their new home with a party! January 12, 7:30 p.m. - ?? This one is for the grown-ups only! Overall, the most important thing to remember is to give your guests all of the information they need to show up to your party comfortable and ready to have a good time. Housewarming parties are generally fairly casual events, but if you have a specific dress code in mind, don't forget to specify that. Asking for gifts on your own invitation is usually considered to be bad form, but if you are throwing a housewarming party for someone else, it is acceptable to mention a few gift suggestions. Last but not least, if you're unsure whether or not include a piece of information, it's usually best to add it. Your guests would rather have too much info than worry about showing up to a party wearing the wrong clothes or bringing the wrong gift.